In Diver Jimmy, we follow the story of a young boy that inherits a beach house from his grandfather, and in it he finds a coffer that hosts a piece of an ancient artifact that holds amazing powers. Based on this, he tries to enter the world and get the artifact. Unfortunately, he finds that the artifact piece has been stolen by pirates, and, as such, he needs to go and recover it at all costs. This is where we enter the world of Diver Jimmy, and from here onward we need to use all our diving skills in order to go underwater and enter levels filled with enemies and treasure alike. As you enter each of the 60 levels in the game, you will always have the same objective, and that is to collect all 4 or more treasures in the game world, then get back to the ship safely. In the beginning, the game starts offquite easily, but as time passes, it manages to provide a wide range of interesting and exciting challenges since more and more enemy types are thrown into the mix, not to mention that enemies tend to become more powerful as well. What we liked about Diver Jimmy is the fact that it comes with a multitude of levels and, on top of that, it even includes numerous challenges to complete. Another neat thing is that you always find yourself in front of newer and newer challenges. From beginning to the end, you always uncover new enemies, so no matter how much you played the game, you surely didn't manage to discover it all, which is pretty cool to be honest! The platforming element in Diver Jimmy works seamlessly and the neat thing here is that while you jump, you can actually continue the jump via diving, which provides you with a much longer reach so you can reach bonus locations or hidden treasures. Graphics in Diver Jimmy are very good, especially for a free game, and the title does manage to bring diverse locations, since it includes 3 unique worlds. Each level does manage to differ from the other, and the character design is also spectacular as well, something that we liked a lot. The soundtrack in Diver Jimmy is one of the game's major surprises. It's action packed, yet still very funny and you will always come back to listen it often. Is the game worth a try? Absolutely, because you will fall in love with the graphics, the cute creatures in the underworld and the exciting gameplay. 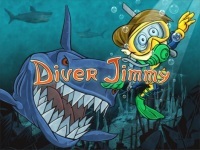 Diver Jimmy is a great platform game, one that you will be playing for hours and hours for sure. Don't hesitate and check the game out, this is one of the best platform games we have played in recent years! children like this. great graphics. loved it. Playing while learning letters, numbers, and interesting pictures.